About (Owner’s description): Blombos Cave was discovered in 1991 by Wits researcher, Professor Christopher Henshilwood. In it, archaeologists found marine shell beads, engraved ochre and bone tools that date back 75 000 years. 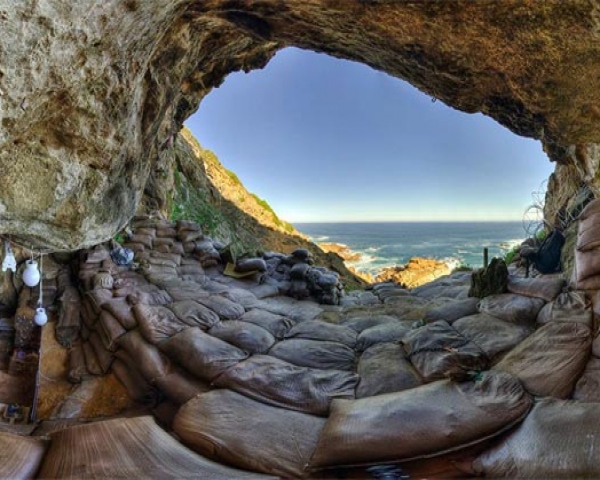 Blombos Cave is an archaeological site located in Blombosfontein Nature Reserve, about 300 km east of Cape Town on the Southern Cape coastline, South Africa. Blombos Cave is some 100 metres from the coast and 35 metres above sea level. Interior cave deposits, including those in recesses, cover more than 80 square metres. About 20 square metres of the Middle Stone Age (MSA) has been excavated to a depth of about 2 metres below the original surface. Excavations carried out since 1991 at Blombos Cave provide snapshots of life in the African MSA in the southern Cape, South Africa. The cave contains Middle Stone Age deposits currently dated at between c. 100,000 and 70,000 years before present (BP), and a Late Stone Age sequence dated at between 2000 and 300 years BP. The cave site was first excavated in 1991 and field work has been conducted there on a regular basis since 1997 – and is ongoing. The excavations at Blombos Cave have yielded important new information on the behavioural evolution of modern humans. The archaeological record from this cave site has been central in the ongoing debate on the cognitive and cultural origin of early humans and to the current understanding of when and where key behavioural innovations emerged among Homo sapiens in southern Africa during the Late Pleistocene. Archaeological material and faunal remains recovered from the Middle Stone Age phase in Blombos Cave – dated to ca. 100,000–70,000 years BP – are considered to represent greater ecological niche adaptation, a more diverse set of subsistence and procurements strategies, adoption of multi-step technology and manufacture of composite tools, stylistic elaboration, increased economic and social organisation and occurrence of symbolically mediated behaviour. The most informative archaeological material from Blombos Cave includes engraved ochre, engraved bone ochre processing kits, marine shell beads, refined bone and stone tools and a broad range of terrestrial and marine faunal remains, including shellfish, birds, tortoise and ostrich egg shell and mammals of various sizes. These findings, together with subsequent re-analysis and excavation of other Middle Stone Age sites in southern Africa, have resulted in a paradigm shift with regards to the understanding of the timing and location of the development of modern human behaviour.